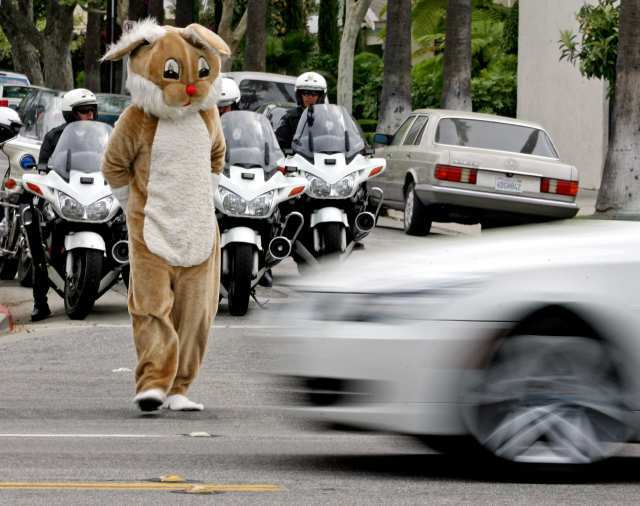 How We Drive, the Blog of Tom Vanderbilt’s Traffic » Blog Archive » How Can You Miss a Six-Foot Rabbit? How Can You Miss a Six-Foot Rabbit? When it’s a pedestrian in California. The report is here, via The Invisible Gorilla, the new blog for the new book by Christopher Chabris and Daniel Simons. A “dangerous stunt” indeed; almost as dangerous as actually crossing the road! Though I dare say this has less to do with inattentional blindness than the typical failure — due to lack of interest or legal understanding — of drivers to yield to pedestrians. Though per the “safety in numbers” effect, it might help if the rabbit were joined by many other giant rabbits, in which case we’d probably have other things to worry about than crosswalk compliance. This entry was posted on Tuesday, April 13th, 2010 at 11:40 am	and is filed under Pedestrians, Traffic safety. You can follow any responses to this entry through the RSS 2.0 feed. Both comments and pings are currently closed.